1) This house had to have gutters back when it was built, right? My theory would be built in gutters since it has decorative cornice brackets, but if it had gutters at the time, I would expect to see a change in slope where they were roofed over, since there don't seem to be any now (It was re-roofed two years ago and has no visible downspouts, so I assume if it had internal gutters they're roofed over). However, there's not a change in pitch on all the roofs, just on a couple of minor ones (pointed out with red arrows in the pictures, the image uploader won't work so they're here: https://www.flickr.com/photos/[email protected]/). 2) Is it possible to restore roofed-over built in gutters, especially without replacing the whole roof? 3) If not possible, what would be best to replace it with? I don't really want to ruin the look of the lovely cornice brackets, but if the water is not controlled there won't be any exterior woodwork to preserve. Your house probably had slate originally, or wood shingles. There are two possibilities for the gutter method, Box and Yankee. 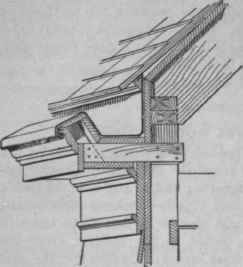 Box gutters were sometimes set back up the slope 10-12" There would be two courses of slates at the edge of the roof beyond the gutter. The yankee type is constructed on top of the roof decking, and if removed would not leave many traces. You note that with both kinds of box gutters I showed you, the slope of the roof is not flared.